The final segment of the Cao Lanh Bridge crossing the Tien River, in the Mekong Delta province of Dong Thap, was slotted into place at a ceremony held by the provincial People’s Committee and the Cuu Long Corporation For Investment, Development and Project Management of Infrastructure (Cuu Long CIPM) on September 1. The Cao Lanh Bridge connecting Cao Lanh City and Lap Vo District is located 800 meters from the Cao Lanh Ferry and about 35 kilometres from My Thuan bridge. The 2,000-metre long mega-structure is 24.5m wide and has four lanes for motorised vehicles and two others for non-motorised ones. The bridge has a total investment capital of VND3,000 billion (US$132 million) funded by Australia’s non-refundable aid, the Asia Development Bank and Vietnam’s correspondent fund,and counterpart funding from the Vietnamese government. 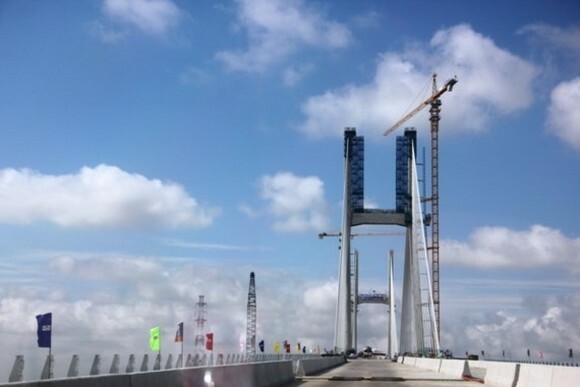 The Cao Lanh bridge is scheduled to be opened by the end of 2017.